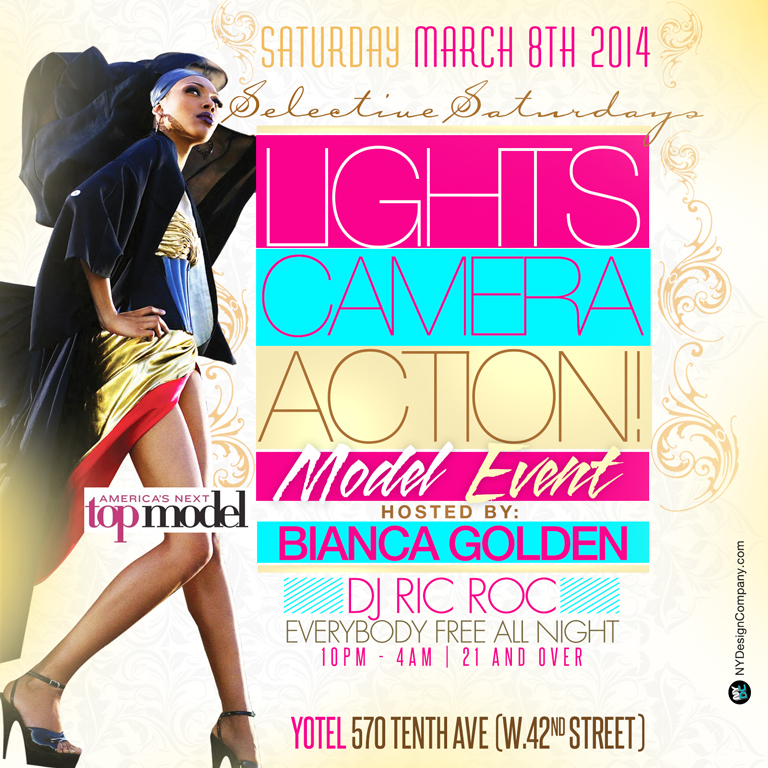 New York, NY | March 8, 2014 | America’s Next Top Model Bianca Golden as Hostess: Lights!! Camera!! Action!! This Models event for this first year models showcase as the premier models and competition event in New York City. Only an exclusive amount of models are allowed to register. Modeling opportunities will be available for emerging National- International Models. This event is a one day model’s event that offers models an opportunity to broaden their brand development process, receive professional modeling training and to compete in front of New York’s top modeling agencies and talent scouts. Through having an integrated marketing campaign and New York exposure in New York based Magazines, radio stations, bloggers, social media, retailers, store owners and the general public. This event provides three platforms (1) Training Workshop (2) Photo Shoot and (3) Model Talent Competition. It is designed to bring an educational training platform combined with models receiving professional marketing tools to enhance each individual model’s portfolio. This is for aspiring and experienced models who are seeking to gain a better understanding of the process to becoming a successful model, brand or talent in the entertainment industry. Opportunities include competing in front of a Judges’ Panel with America’s Next Top Model Bianca Golden as Hostess and Judge, casting directors, talent scouts, modeling agencies, photographers, and designers for the opportunity to be selected for modeling representation, and near future modeling and performing artist projects. In addition models also receive media relations coverage prior, during and following this grand event. We are focusing primarily on models and entrepreneurs understanding brand development, agency networking and empowerment for everyone. Specializing in modeling and acting training as well as brand development management, modeling productions, and performing arts projects across the United States. We have worked with the most ambitious and diverse models emerging across the United States and in South Africa. COMPLETE MODEL COACHING, CONSULTATION, ADVICE, MANAGEMENT, REPRESENTATION & PLACEMENT. Lights!! Camera!! Action!! Models Event!! Due to our recent sponsorship on behalf of the Yotel, which the Yotel is located in the city, LCA team felt that it was best to make things more convenient for everyone involved to move our main event venue over to the Double Tree Hilton, which is where our event hotel accommodations are booked at for this event as well and only four minutes away from the Yotel. You will find the Double Tree Hilton address located on top of this page. Thank you for your participation and commitment to LCA Models event and looking forward to meeting you soon! PLEASE CLICK AND WATCH THE BELOW YOU TUBE!